School is officially back in session, which means that you are going to start seeing the dreaded flashing yellow light again. School zones are not fun when you are in a hurry, or any time for that matter, but they are there for a reason. What is the point of school zones? There tends to be a lot of children around schools (imagine that), and these children may not always stop and look both ways before crossing the street. That is why you need to take the responsibility of watching for them, which is very hard to do at 40 miles per hour. Yes, it may be inconvenient, and it may frustrate you, but what if it was your kid that decided to sprint across the street at a moment’s notice? I bet you would be thankful if the drivers on the road noticed, because they were going the required 15 miles per hour, and were able to stop in time. Not to mention, the fatality rate if a child is hit is dramatically lower at reduced speeds. The Institute of Transportation Engineers reports that the fatality rate at 20 mph or less is only 5%, compared to rates of 40, 80, and basically 100 percent if the car is moving 30, 40, or 50 mph respectively. What’s the consequence if I don’t slow down? If the safety of the children is not enough of a reason for you to slow down, then what about the impact on your wallet? 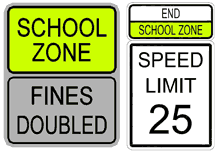 Allstate Insurance Company recently did a survey of 80 police stations throughout Texas and they found that the average ticket for speeding in a school zone costs $211. That’s an awful lot of money just to save a few minutes on your drive. Remember, most school zones are for very short distances. All you have to do is slow down and drive extra defensively for five minutes, and you can save yourself a ticket, and maybe even a life.